Dubbed by Nissan a "social lounge," the 2015 Nissan Murano is designed to transport two sophisticated couples - and sometimes a friend - in style and comfort. In addition, the Murano offers laudable all-around handling, top fuel economy and a string of cool features. We love our Murano. We are currently a family of 3, with another baby on the way and the Murano is the perfect size. Not too big, not too small. It is so comfortable being the driver and the passenger. The back seat is roomy and comfortable and the back seats recline, which is nice. The interior really has the look and feel of a more luxury vehicle with chrome accents, etc. The back hatch/trunk is nice and roomy. I can keep our everyday essentials like sand toys, outdoor blanket, etc. And still have lots of room for what I go grocery shopping. So far it is been a great reliable car. Nice to drive and quiet on the road. I could definitely see us continuing with Murano as our family vehicle. It also feels very safe and has great safety ratings! Positive details on the Nissan Murano as a great family vehicle! The Nissan Murano does not have any problems. I just do not care for the way the front quarter panels stick out because I cannot see around them because I am too short and therefore have a hard time judging distance when backing up. The performance is great and the gas mileage is pretty good for a full size vehicle. The interior has lots of room as does the rear compartment. My 135 lb. Tibetan mastiff thinks there is plenty of room for him to lie down or sit up and look out. We have had no mechanical problems at all in the 3 years we have owned it. And my husband who is 6' 3" tall and 300 pounds can easily fit into it where he has problems with other makes when getting in the car. . He always hits his head on the door jambs of other vehicles. This vehicle was not acquired new and to date I have not had any problems. I am very amazed at the roominess of my Murano. My family of four consist of two males who are both over six feet weighing in at close to three hundred pounds each. We all can ride very comfortably in the Murano. The only issue I have had is with the design. Which is when I have to look over my right shoulder from drivers seat, there appears to be something in my line of vision causing me to brake thinking another vehicle was too close. I have had to keep reminding myself that it is simply the design of my Murano. 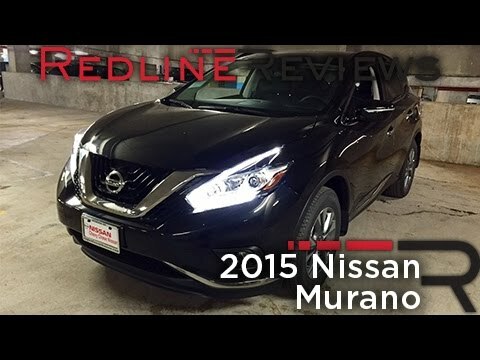 2015 Nissan Murano DETAILED Review and Road Test - In 4K! Nissan North America, Inc. (Nissan) is recalling certain model year 2016-2017 Nissan Maxima vehicles manufactured February 10, 2015, to August 19, 2016 and equipped with Intelligent Cruise Control, 2015-2017 Murano vehicles manufactured August 22, 2014, to August 19, 2016 and equipped with Intelligent Cruise Control, and 2015-2016 Murano Hybrid vehicles manufactured August 22, 2014, to July 19, 2016. The affected vehicles have Anti-Lock Brake (ABS) actuator pumps that may allow brake fluid to leak onto an internal electrical circuit board. A brake fluid leak onto the circuit board may result in an electrical short, increasing the risk of a fire. Nissan will notify owners, and dealers will inspect the ABS Actuator, replacing it as necessary, free of charge. The recall began on December 12, 2016. Owners may contact Nissan customer service at 1-800-647-7261. Note: When brake fluid has leaked onto the circuit board, the ABS warning lamp will remain illuminated for more than 10 seconds after engine start up. If this occurs, owners are advised to park the vehicle outdoors away from other vehicles or structures and to not drive the vehicle. Under some driving conditions, when the ABS is activated, the malfunctioning ABS actuator could cause a loss of vehicle stability, increasing the risk of a crash. Nissan will notify owners, and dealers will inspect and replace the ABS actuator, as necessary, free of charge. The recall began on August 13, 2015. Owners may contact Nissan customer service at 1-800-647-7261. Nissan will notify owners, and dealers will inspect the serial number on the ABS actuator, replacing it as necessary, free of charge. The recall began October 29, 2018. Owners may contact Nissan customer service at 1-800-867-7669. Note: When brake fluid has leaked onto the circuit board, the ABS warning lamp will remain illuminated for more than 10 seconds after engine start up. If this occurs, owners are advised to park the vehicle outdoors away from other vehicles or structures and to not drive the vehicle.